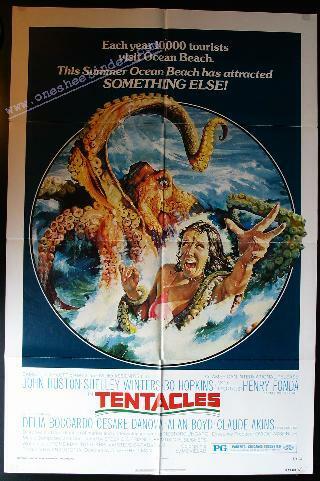 American International's Tentacles which opened in 1977, is a shocking drama of an 80-foot octopus which is maddened by man's oceanographic activities. From hidden depths it haunts the beach near San Diego, California, suddenly, silently seizing victims. John Huston, Shelley Winters, Bo Hopkins, Henry Fonda and Cesare Danova are among the stars involved in the strange deaths. To prepare for such an unusual film they all studied, to a greater or lesser degree, the implications of the use of sophisticated electronic, sound wave, and other underseas exploration equipment. Bo Hopkins, who plays a marine scientist, spent several days at Sea World and Marineland, discussing undersea life, and became proficient guiding killer whales in certain maneuvers. John Huston, as a journalist, and Henry Fonda and Cesare Danova as underseas construction experts, made it their business as conscientious actors to familiarize themselves with "what's new in underwater exploration." Tentacles has the ring of reality. It was filmed in California and Ercole, Italy. Especially unforgettable is a battle filmed in the Mediterranean, between the octopus and two killer whales, with Bo Hopkins part of the life or death struggle. Apparently Tentacles attract more than victims, they also attract stars who believe in the motion picture about them. John Huston, Shelley Winters, Bo Hopkins, Henry Fonda, Cesare Danova and Claude Akins are among the stars of this unique film which was photographed for 14 weeks near San Diego and in the mysterious Mediterranean waters at Ercole, Italy. Two other "stars" are "friendly" killer whales that battle the octopus. Tentacles may be the story of things to come, because it shows how a tremendous octopus is maddened by underwater vibrations caused by man in his "rearranging" the seas. Other forms of aquatic life may be next, as the growing terror of the oceanside residents in this picture reveals.